Helen Naylor is ready to try and return Westfield Health Sheffield Hatters to past glories after putting pen to paper on a deal for 2017-18. 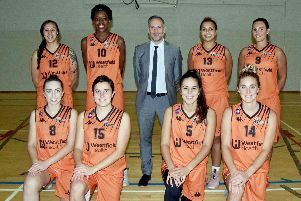 The Great Britain wing is one of the WBBL’s leading players and is determined to get some trophies back in the cupboard after the club sustained a lean-time during 2016-17. “I’m really pleased to announce that I am going to be remaining at Hatters and I don’t think it’s any secret that last year was frustrating and disappointing for us in terms of lack of silverware,” stated Naylor. “There was also a lack of consistency in our performance at times, but we sat down after the season and made plans and goals for this forthcoming year and I’m excited to get going again with the team. “We’re looking forward to the new season and we have all been working hard over the summer to get our bodies in better shape and injury free. She continued: “We are going to have a good mix of youth and experience and a number of new signings that will only strengthen and add depth to our existing core players. “I am hoping that we can return to playing a fast break style of basketball, pushing the ball up the floor and playing a better style of team basketball than last season- as these were all things that when we got right last year lead to us wining tough games. “I think the league continues to grow and get stronger and it’s really great to be a part of that and to have tougher more challenging games week in week out. “From our point of view, we firmly have our sights set on doing what it takes to get back to being contenders for silverware, and making it back to the big arena games that we missed out on last season,” concluded Naylor. * A trio of young Hatters - Maizie Melady, Stephanie Oliver and Gianah Modest - played their part as the Yorkshire team impressed in the Basketball England’s Regional Development Tournament. Yorkshire finished third out of the nine regions and coach Michael Carnall paid tribute to the Sheffield girls, who are pictured above right: “Maizie was captain of the team and flourished as a leader both on and off the court, backed up by solid defensive work and rebounding from Gianah despite her being the smallest member of the squad. Steph showed great promise being Yorkshire’s leading scorer throughout the tournament despite her being one of the youngest players on the team. “All three girls stood out from the crowd and as their coach I believe all three have the potential to go further both in the Hatters system and hopefully the National Team Development Programmes too.